It’s taken more than a decade from original concepts to construction, but ground has finally broken on the 15-acre M City condominium development at the corner of Burnhamthorpe Road and Confederation Parkway in Mississauga. “These buildings will bookend the downtown of Mississauga,” said Mark Reeve, a partner with Urban Capital, which is developing the site along with Rogers Real Estate Development Limited. “The Marilyn Monroe towers are on the east side and we’ll frame the west side. The site has six decades of history for the Rogers family. Ted Rogers, the late Canadian communications tycoon, purchased 43 hectares of farmland in Mississauga on which to locate transmitters for Toronto radio station CHFI in the 1960s. When the transmitters were relocated in the early 1990s, Rogers developed some of the property and sold land to other builders for new homes. The current site was rezoned in 2002 to allow for a wider possibility of land uses, including increased residential development. The private holding company owned by the Rogers family enlisted Urban Capital in 2007 to “determine how to best crystallize the value for the property,” said Reeve. New York City-based urban design firm Cooper Robertson was brought on board to design the framework for M City. It contributed to a comprehensive master plan for more than 6,000 residential units as part of a sustainable live, work and play community that emphasizes the public realm. The framework will extend existing city streets and create a network of blocks that will provide two-way roads with on-street parking, generous sidewalks and residential frontages. 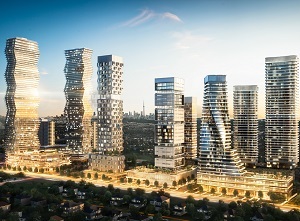 The plan coincided with Mississauga’s Downtown21 Master Plan, which contains a vision to create a more vibrant downtown core home to public spaces, educational institutions, a public transit network, walkable streets, and intensified residential and commercial developments for the city of more than 700,000 just west of Toronto. “We launched in March of last year to much acclaim and excitement,” said Reeve, adding that 2,500 real estate agents showed up on the first day for a preview at a local movie theatre. The first tower received 13,500 offers for 550 units in the first three days, so a second building was quickly brought to market. The two 62-storey towers, M1 and M2, are a combined 93 per cent sold-out. The construction budget is $378 million. Toronto-based CORE Architects is responsible for building design. Toronto’s Cecconi Simone is handling the interiors. This first phase of the development will feature a mix of studios, one-, two- and three-bedroom units, as well as townhomes. They’ll range in size from 400 to 1,350 square feet and in price from $250,000 to $900,000. M1 and M2 are expected to be fully occupied within four years. M1 will have a skating rink, an outdoor swimming pool, a splash pad, a sports bar, a fitness centre, steam rooms, a party room, multiple-use lounges, a dining room with a kitchen, an indoor children’s play area, an outdoor playground and guest suites. M2 will have a very similar amenity offering, with a movie theatre, a swimming pool, a splash pad, a fitness centre, steam rooms, a party room, multiple-use lounges, a dining room with a kitchen, an indoor children’s play area, an outdoor playground and guest suites. The buildings will offer ample parking. “We basically have a parking stall for every unit, plus visitor parking and retail parking,” said Reeve. Two acres of parkland are being incorporated into the first phase of M City. There’s also 30,000 square feet of retail space planned at M1 and another 11,000 square feet of retail space will be connected to M2. Leasing activity for this space isn’t expected to begin for about six months, but Reeve said interest has been expressed by major food retailers and smaller users. A fall launch is anticipated for M3, which Reeve said will be a tower on a podium similar to the first two buildings, but with a completely different design. M City’s original plan called for 10 residential buildings. However, because the first two towers are higher than originally envisioned, the developers might opt for eight larger buildings. “We’ll just see how the market evolves,” said Reeve.